Yield: Yields 12 to 14 cups. For a stuffing with a bit of heat, use hot Italian sausage or even chorizo. This stuffing is delicious when cooked inside the bird, we like this simple, juicy roast turkey. If you plan to cook the stuffing separately, follow the instructions below, it can be cooked in the same oven or at the same temperature as your turkey. In a large skillet, cook the sausage over medium heat until browned. Remove with a slotted spoon and set aside. Add enough rendered bacon fat or butter to the pan to get about 5 Tbs. total fat. Add the onion, celery, peppers, garlic, thyme, red pepper flakes, and salt. Cook briefly until the onion is softened. With a wooden spoon, scrape up any browned bits in the pan. Combine in a large bowl with the crumbled cornbread, scallions, parsley, chives, and pepper. Toss to combine. If cooking in a turkey, put the stuffing in the bird just before roasting. Pack the stuffing loosely, leaving enough room to fit your whole extended hand into the bird’s cavity. Cook the stuffing in the bird to 160º to 165ºF, checking with an instant-read thermometer. If the bird is done before the stuffing is, take the bird out of the oven, spoon the stuffing into a casserole dish, and continue to bake it while the turkey rests. 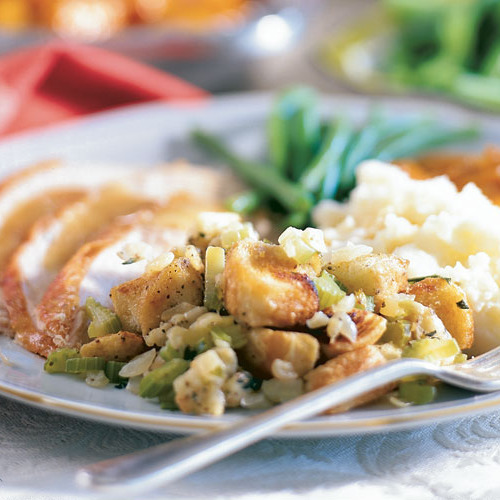 If baking some or all of the stuffing in a casserole, pour a cup or two of stock over the stuffing to replace the juices the stuffing would have absorbed from the bird. Bake it covered until heated through, 45 minutes to 1 hour. For a crunchy top, uncover it for the last 15 minutes of baking. This dressing is always a hit. I use chorizo and everyone loves the heat. This was a new recipe for us this year and it was terrific! 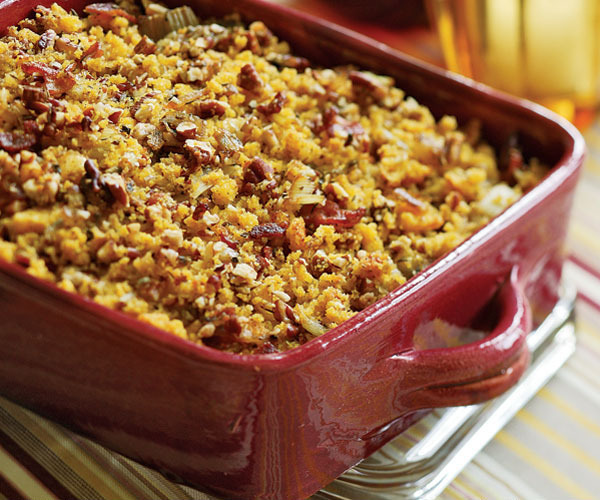 I used chorizo and also added an almost ripe pear for flavor and texture - this has our vote for a favorite stuffing.